As most of you probably know by now, I love to travel. I don't get to travel nearly as much as I'd like. It gives me something to work toward though! In March I went to California. I had so much good food. I was amazed at the food compared to where I live. If any of you are a CA residents or are planning on visiting you must go to Cafe Gratitude. Cafe Gratitude is an organic vegan restaurant located in Venice, Santa Cruz, Berkeley, and Los Angeles. I went to the Venice location, although when I get back to California (hopefully within the next year) I will be hitting up a few of the other locations just to check them out. We went in and were seated right away. Our waiter was very friendly and helpful suggesting various dishes to try for our first time. Each item on the menu has a special name such as, "I Am Humble" "I Am Immortal" "I Am Outstanding"
I started off the morning with an "I Am Fiery" elixir which is a digestion aid shot. Then I went with the "I Am Open-Hearted." 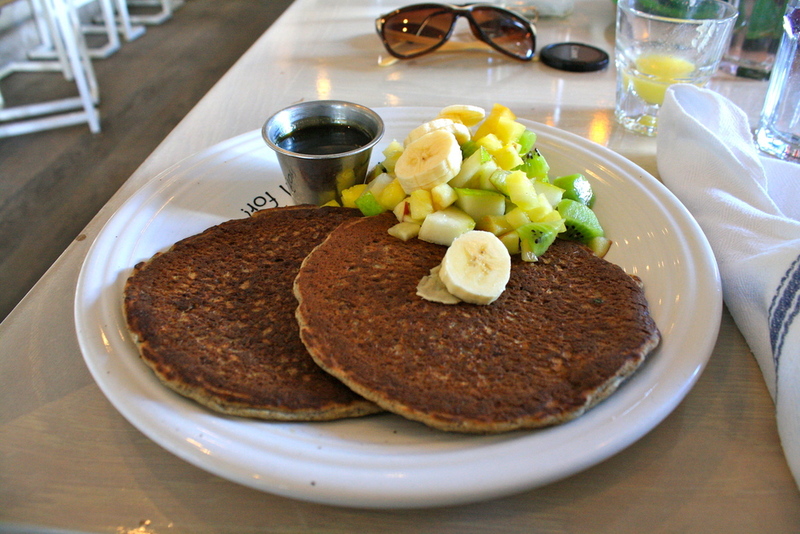 Two buckwheat-flax pancakes topped with fresh fruit. Definite 10/10. The atmosphere of Cafe Gratitude is like no other. The service is great and the atmosphere is very welcoming and comfy. I can't think of a better way to enjoy some delicious food! Even if you're an avid meat lover, you must try Cafe Gratitude at least once. I promise that you won't regret it. Put Cafe Gratitude on your to-do list for this summer! Treat yourself because "You Are Incredible."